It is always a challenge to get ESL students to speak, but with this set of Conversation Cards you’ll see your students break down barriers and begin to flourish. 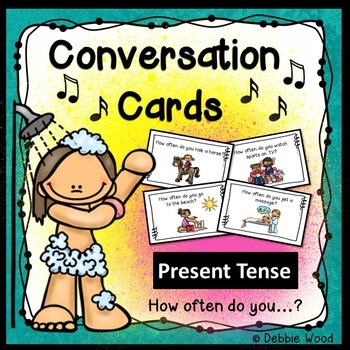 This set includes 32 conversation cards which focus on the present tense and the adverbs of frequency. These cards include questions such as…How often do you sing in the shower? How often do you eat breakfast? How often do you go fishing? Etc. Students will need to respond using the adverbs of frequency (i.e. always, usually, often, sometimes, rarely, never). 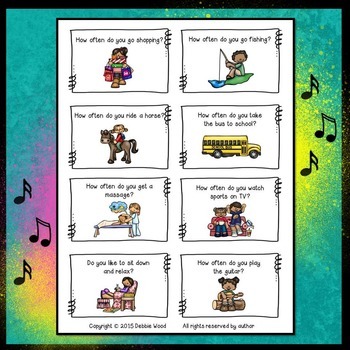 You can laminate and cut up these conversation cards to use them in a variety of different ways in your classroom. 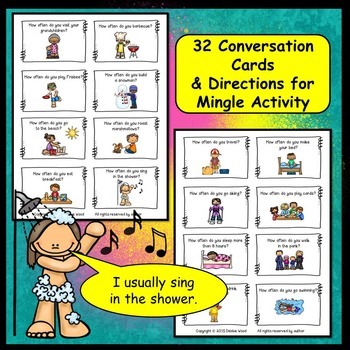 I have also included the directions on how to implement a fun mingle activity in your own classroom. Sometimes I do a follow up activity in which the students have to choose one card and write about it in their journals. 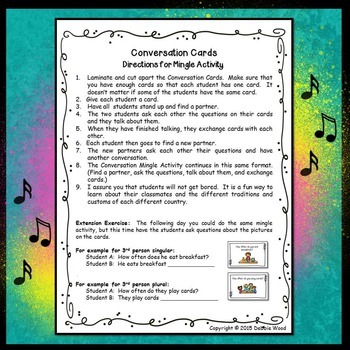 Your students will love these conversation cards! This set is good for Beginning High students or for Intermediate Low students as a review at the beginning of the year.